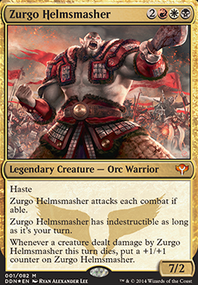 This is a voltron commander focusing only on Zurgo and getting your opponent to 21 commander damage or 10 infect quickly as possible. the deck only has 2 creatures in it, while the rest of the deck is board wipes, pump spells (enchantments) and some minor control based cards. Since the deck is mostly spell based you can change up your toolbox of kill spells to fit your meta.